Grilling isn't the traditional method of cooking crab legs, but it is a quick and easy way to cook this tasty treat. Crab legs cook quickly; you can buy already-cooked crab legs or cook them fresh. You can grill on a charcoal or gas grill; a gas grill gives you better temperature control, but charcoal adds a smoky flavor. Crabs come in different varieties and sizes, and their legs also vary in size. The bigger the crab leg, the easier it is to extract and eat the crabmeat. Larger crab legs are also easier to grill because they're easier to grab with the tongs and turn than smaller legs. 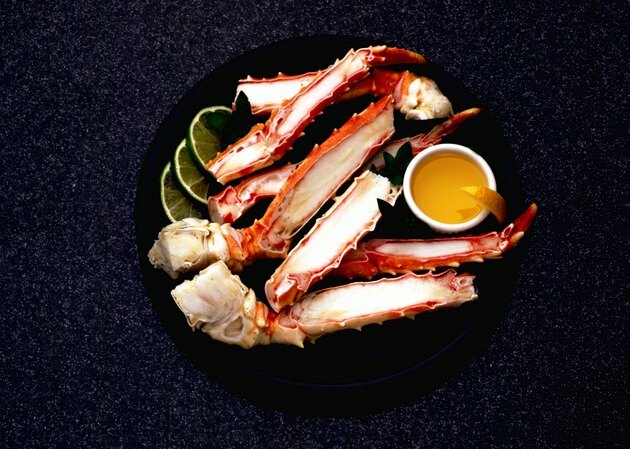 Alaskan king crabs, snow crabs and Dungeness crabs all have large legs with lots of meat. King and snow crab legs are often sold frozen. Blue crab are smaller in size and have less meat in their legs. If you're using a gas grill to grill crab legs, preheat the grill temperature to 350 to 375 F on direct heat. If you're using frozen crab legs, take the bag out of the freezer and let it thaw in cold water or just thaw on the counter while the grill heats. Frozen crab legs don't need to be completely thawed before you grill them; they warm up fast and they're already cooked. Crab leg meat dipped in melted butter is simple and delicious, but you don't have to stop there when it comes to seasoning crab legs on the grill. Cutting the legs lengthwise allows you to season them directly and also makes the meat easier to remove, author Andrew Schloss recommends in "Fire It Up: 400 Recipes for Grilling Everything." Add any seafood seasoning or make your own marinade and baste the crabmeat with it while cooking. Place crab legs directly on the hot grill meat-side up if you cut the shells. A little oil rubbed on the crab legs helps prevent them from sticking to the grill; you can also use a vegetable oil spray on the grill grates. Cook for just four to five minutes per side for good-sized crab legs. Grill with the lid open. Don't overcook or the meat will turn rubbery and lose some of its flavor. The meat at the ends of the crab should be firm and white, and not rubbery. You should also be able to smell the sweet smell of perfectly cooked crabmeat.